Powerful, Genre-defying Music from Trio HLK and Dame Evelyn Glennie – Concert Review, The Royal Welsh College of Music and Drama. Powerful, Genre-defying Music from Trio HLK and Dame Evelyn Glennie. The Royal Welsh College of Music and Drama. Seen and Heard International, review by Glyn Pursglove. This concert, as well as being part of the Royal Welsh College of Music and Drama’s Amser Jazz / Jazz Tine Festival (spread over five days and involving both visiting professional bands and performances by many of its own very accomplished students) was also part of the launch tour for Trio HLK’s debut CD, Standard Time (Ubuntu UBU 0006), on which the Scottish trio are joined by Dame Evelyn Glennie and American alto saxophonist Steve Lehman. Lehman did not join the launch tour, but Glennie was here (and very much, in her charming way, a mighty force!). Standard Time is a punning title – suggesting phrases such as ‘Eastern Standard Time’ and the associated world of precisely measured time (the design on the cover of the CD is made up of the parts from a disassembled watch or clock), as well as the idea of ‘jazz standards’, those compositions which make up a repertoire common to the great majority of jazz musicians. Indeed, much of the music to be heard on the album and played in this concert was grounded (in somewhat remote and complex ways) in jazz standards (of which more later). Trio HLK takes its name from the first letter of its members’ surnames: pianist Rich Harrold, guitarist Ant Law and drummer Rich Kass. As one nowadays expects from ensembles of young musicians regarded as playing jazz, the music of this trio draws on much more than just the jazz tradition. Any attempt at an exhaustive catalogue of such contributing influences would be irrelevant in a review of this kind and, in any case, beyond me. But it is perhaps worth saying that elements reminiscent of techno- and dubstep, of M-base, of heavy rock guitar and of some compositional methods from modern ‘classical’ music, are all part of the mix. This is complex music, not easily accessible on a first hearing. I was glad to have had the chance to hear Standard Time before attending this concert (and then to buy my own copy). The sometimes almost metronomic rhythms, the abrupt changes of time signature and tempo, the harmonic complexity, therefore came as less of a surprise. Those watch parts on the CD cover seemed more and more apt. This is music with a complex mechanism, in which pre-existing musical materials are often taken apart and, from some of the resulting ‘pieces’ something new is made. In the very brief note included on the folder of Standard Time we are told that some of compositions recorded had ‘taken as their starting point material from popular jazz standards. In each of these pieces, a small number of key features of the original (motivic fragments, small chunks of harmony) have been used as the raw material for new compositions’. During the concert Rich Harrold introduced one piece as ‘our version of Dizzy Gillespie’s ‘Anthropology’. This is one of our most recent compositions’; thus blurring the distinction between a piece written by Gillespie and a piece produced by the group or one of its members. In a brief post-concert conversation with Harrold, I told him that on just one hearing (this piece is not on the CD) I had struggled to identify the connection with Parker and Gillespie’s bop standard, itself built on the chord progression of George Gershwin’s ‘I Got Rhythm’; ‘We used just a small cell from the melody and built on that’ said the pianist. When I told him that during his solo on this number I felt that I could hear a distant ghost of Bud Powell, the answer came back, ‘You have good ears if you could hear that’ and from the smile on Harrold’s face I took the answer to mean that I had probably imagined it, though he then added ‘Yes, I suppose so, in those dyads in the left hand’. The evening had begun (minus Glennie) with the trio’s version of Jerome Kern’s ‘The Way You Look Tonight’ – which appears on their CD as ‘TWILT’. The piece was full of rhythmic suspensions, with the work of drummer Rich Kass immediately making a strong impression, in terms both of its precision and its power, whether in sustaining passages of relatively old-fashioned swing, choppily interrupting the music’s flow, or setting up the insistently repetitive patterns so common in HLK’s music. Harrold’s solo was attractively phrased and had clearer connections to ‘The Way You Look Tonight’ that much else in the piece did. Ant Law’s fine guitar solo was less rock-influenced than some of his work, though it didn’t lack bite. Evelyn Glennie was brought on stage at the end of this first number, taking up her position behind her considerable array of percussion (including vibraphone, marimba, timpani, a basic ‘jazz’ drum kit – less complex than the one played by Kass – and a substantial collection of ‘small’ instruments). The first quartet number was Miles Davis’ ‘Blue in Green’ which, since its first recorded appearance on Kind of Blue in 1959, has been recorded by many significant jazz figures, such as Bill Evans (on his Portrait in Jazz) – who is generally understood to have had a hand in the original composition of the tune, by Gary Burton and Stéphane Grappelli (Paris Encounter), John McLaughlin (My Goal’s Beyond) and many others. Trio HLK’s version, predictably, was utterly distinctive. A deal of it hovered around the chords of G minor ands A augmented, which dominate the original. I had less sense of the ten-bar thematic phrasing of ‘Blue in Green’. It was the rhythmic complexity which was the joy of this ‘interpretation’, with polyrhythmic patterns initially set up by Kass and soon complemented by Glennie at her tuned percussion (which was used in intricate dialogue with Harrold’s piano at times, very effectively). At many points the percussive work was loud and intense, but never remotely messy – having the kind of precision that characterizes the playing of this group. There were moments, however, when I felt (I suspect that this was not a reaction shared by others in the audience) that Law’s guitar was a little too prominent in the balance of the sound. A later number ‘ESP’ initially gave us a lengthy, and magical, passage in which Glennie’s tuned percussion instruments sang out above chords provided by Harrold’s piano. When Kass and Law entered the music became busier and more aggressively percussive. This piece displayed the full quartet’s capacity for both complex rhythms and variations of dynamic. It was a real delight and demonstrated how fully Evelyn Glennie’s contribution was integrated with the work of the established trio. The trio left the stage, allowing Evelyn Glennie to play her one ‘solo’ piece of the evening. She did so using a halo drum – a small steel drum, capable of only a few pitches and having a rather hollow and melancholy sound. I placed solo in inverted commas in the previous sentence, since Glennie actually played – alongside a pre-recorded tape (unfortunately not clearly audible from where I was sitting, using cello and marimba as far as I could tell) – a piece called ‘Orologeria aureola’, co-written by Glennie and Philip Sheppard, it was performed at the Proms in 2015. In 4/4, after all the complex rhythms preceding it, ‘Orologeria aureola’, for all that Dame Evelyn’s hands were moving with blurringly rapid speed, was a reflective moment of relative ‘quiet’. ‘Dux’ (described as an original on Standard Time, though with no one composer named) makes governing use of the clave rhythm (for details about this pattern, and its importance see, for example, David Peñalosa’s The Clave Matrix: Afro-Cuban Rhythm-Its Principles and African Origins, 2009). ‘Dux’ began with a duet between Kass and Glennie (initially seated at the small drum kit). They worked together – and ‘off’ each other – with great precision and drive. Law and Harrold entered, at first doing little more than adding chordal punctuation marks, as it were, to the percussive patterns. A certain trance-like quality was created, which wasn’t diminished when Glennie moved to the marimba. Towards the end of ‘Dux’, Kass took a long and very impressive solo, using every bit of his kit, full of complex, overlapping patterns – a solo so good that any jazz drummer would have been proud of it. Rich Kass was little more than a name to me before this concert. He is now a name I shall remember and look out for – and I mean no disrespect to Trio HLK if I say that I look forward to hearing Kass in other contexts too. The evening closed with one of the most radical and startling of Trio HLK’s ‘deconstructions’ in a piece they call ‘Jig’, based (?) on one of the gigues from Bach’s Cello Suites. It would take better ears than I possess to identify which of the six gigues provided the starting point for ‘Jig’. I imagine that ‘Jig’ is built on nothing more than a rhythmic/harmonic fragment from Bach, so that the connection is far from obvious – this was many miles away from Jacques Loussier’s ‘Bach’! (at one point in the concert Ant Law described the group’s treatment of such musical ‘sources’ as a process of ‘refraction’). This ‘remaking’ of Bach included brief passages of quasi-baroque 3/8 rhythms and other passages of rock guitar and rhythms of considerable ferocity. Yet the meticulous attention to detail seemed here to allow a slightly greater freedom to each individual musician than some of the earlier pieces had. 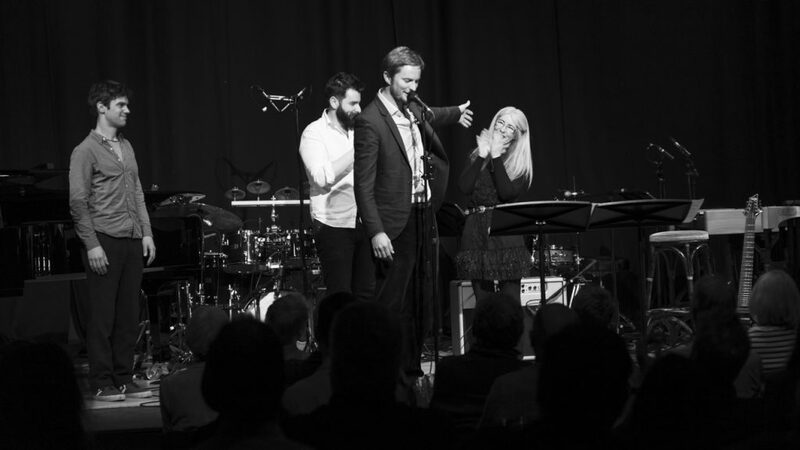 ‘Jig’ formed a lengthy, ecstatic finale in which exactness was fused with some ‘howling’ guitar from Law and some passionately virtuosic vibraphone from Glennie.